PDF of the entire issue (6.7 Mb). 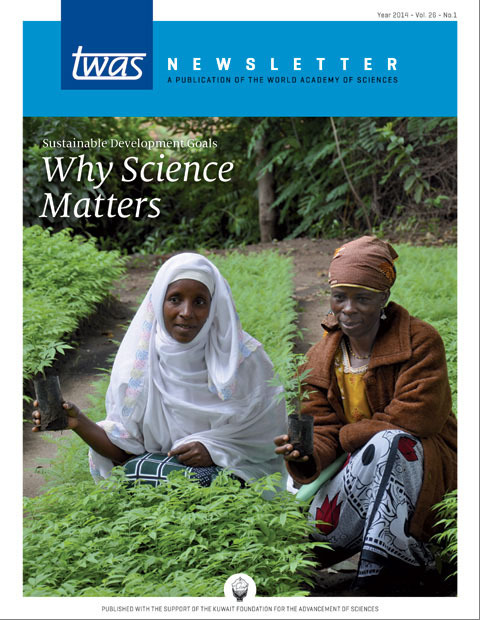 If science is essential for solving the challenges of our time, shouldn’t the new Sustainable Development Goals advocate “Science for All People”? The 70-year wait for primary school, a flood of ocean data, and the search for gravitational waves. It’s brighter, cleaner, and more contemporary. Now the redesigned TWAS website will deliver TWAS opportunities and news to a bigger, broader global audience. Four TWAS Fellows have been named to a new, high-profile panel that will provide high-level science advice to the UN Secretary-General. A TWAS science diplomacy workshop convened developing world researchers and policymakers in Trieste, Italy, for a creative look at energy issues. TWAS joined Rwandan President Paul Kagame, the World Bank and top African leaders to explore how universities on the continent can support S&T. Five chemists with a focus on medical research won the 2014 Elsevier Foundation Awards for Early Career Women Scientists in the Developing World. TWAS President Bai Chunli visits Ecuador and Executive Director Romain Murenzi travelled to the Democratic People’s Republic of Korea.